The Roads and Transport Authority (RTA) in Dubai is hiring and the organisation is encouraging candidates to apply online on its website.The RTA manages roads, Metro, taxi services, tram and water taxi services in the emirate, and ensures they run like clockwork no matter what time of the day or year it is. 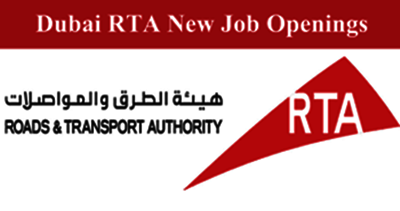 Roads and Transport Authority (RTA) is the place that is offering excellent opportunities for those professionals who are keen to join one of the leading organizations of Dubai Government. Here at RTA," we provide ample growth opportunities & the chances to make a difference in shaping Dubai's image. Our endeavour is to ensure continuous development of our staff by enhancing and developing their competencies & capabilities, with a particular focus on the recruitment & development of UAE Nationals and residents," says the RTA website. RTA is looking for chief analyst, senior analyst, project manager, chief system specialist and senior engineer among others.